With the advent of the internet, the projected viewership of eSports only increases over the years, with prize pools that can reach hundreds of millions in real money. So why not recognize it as a sport? Or does it have to? What’s the difference between a gamer and a traditional athlete? As eSports start to amass an enormous following, organizing some of the biggest crowds in a battle of skill and strategy, it’s also gradually challenging the way we think about Sports. In its essence, traditional sports is defined as an activity that involves physical exertion and skill in which an individual or team competes against another or others for entertainment. Comparably, eSports is where the best of the best in a game that requires mental acuity, eye-hand coordination, and physical endurance to outcompete another player or another team in front of a live audience and millions of others following the game via streaming services all around the globe. 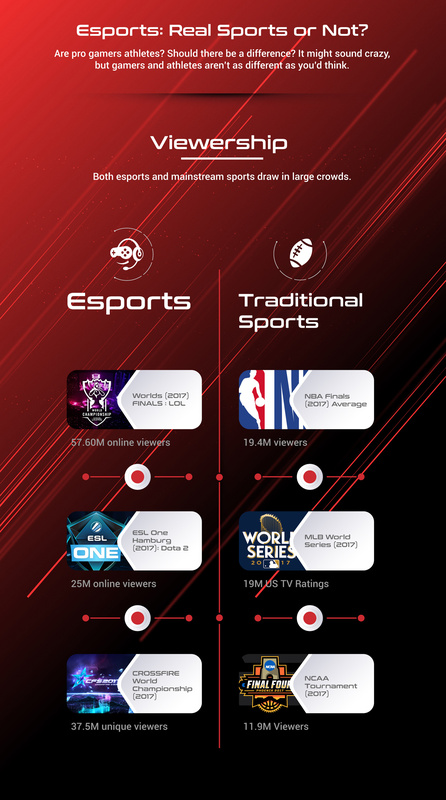 This infographic helps you opine on the issue by laying down figures side by side to produce a fair, data-driven comparison of eSports and traditional sporting events. It also offers a look into the collegiate reality of eSports just like a career track and introduces you to the big-name companies that make things happen in the gaming arena.